We are proud to announce that our latest project in Peninsula Papagayo, Guanacaste has now been approved by our clients, and we are hard at work preparing the Sketch Plan Review Presentation for the Peninsula Papagayo Design Review Board. This is now our fifteenth home that we design in Costa Rica’s most luxurious resort community. Last year we celebrated working in Peninsula Papagayo for ten straight years, and this year we hit the milestone of our 15th home designed in this resort. The Sketch Plan Review is the first revision meeting in the Review Process that all projects must go through. We are confident that our design has been carefully prepared to comply fully with the resort community’s spirit and regulations, and our clients are very excited with the final version of the design. The home is located on a very challenging lot, with very steep inclines and a building envelope line that cuts across “coming down the hillside” which added to the design’s complexity. We have approached the project with a strategy of using multiple levels so that the structures adapt to the site’s natural conditions. Ultimately, we have been able to achieve designing this home with minimal to no intervention to the existing slope conditions. We will post more images of this home in future weeks, for now here is a small glimpse of the design. We will update our site over the next few weeks after we have completed our submittal for the Design Review Board. Keep an eye out for updates so that you can see the full design. 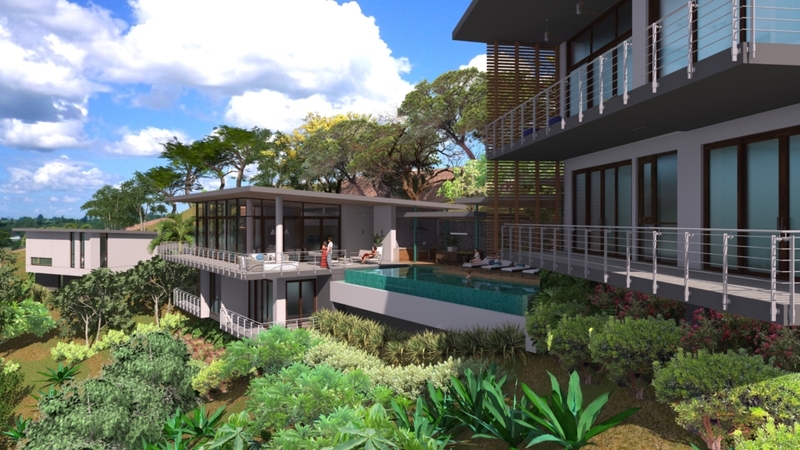 With our latest project, being home number 15 on our list of projects in Peninsula Papagayo we reinforce our position as the architectural firm in Costa Rica that has designed the most private residences in Costa Rica’s most prestigious resort destination. Peninsula Papagayo is the only 5-Star resort in Central and South America.